Today in Masonic History Willis Van Devanter passes away in 1941. 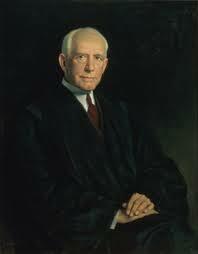 Willis Van Devanter was an American jurist and United States Supreme Court Justice. Van Devanter was born in Marion, Indiana on April 17, 1859. After attending local schools he attended the Cincinnati Law School where he graduated in 1881. After which he returned to Marion where he established a law practice over the next three years. In 1884, Van Devanter moved to the Wyoming Territory. He served as city attorney of Cheyenne. He was also a member of the territorial legislature. When Wyoming received it's statehood in 1890, Devanter served on the Wyoming State Supreme Court for four days. In that same year he started in private practice again, this time in Wyoming. He remained in private practice for seven years. At the end of the seven years he successfully represented the state of Wyoming in a case before the United States Supreme Court. After winning his case before the Supreme Court, Van Devanter stayed in Washington and became an assistant attorney general working for the Department of the Interior until 1900. He also was a professor at The George Washington University Law School from 1897 to 1903. In 1903, Theodore Roosevelt nominated Van Devanter to the Eight Circuit Court of Appeals. In 1910, William Howard Taft, appointed Van Devanter to the United States Supreme Court. On the court he was well known for his conservatism and generally made decisions in favor of smaller federal government. He voted against issues of minimum wage and unemployment insurance. He was one of four justices on the United States Supreme Court who dominated the court during his time their. They were referred to as the Four Horsemen. Van Devanter himself suffered from writers block, some even referred to it as "pen paralysis" so he rarely wrote opinions for the court. He was widely respected when it came to judicial issues. Van Devanter considered retiring from the court in 1932. He remained on the court, he claimed, due to his concern about the New Deal. He also claimed that he need to remain on the court to provide for his sustenance. On June 2nd, 1937, Van Devanter moved to Senior Status on the court. This essentially meant he was retired from the court, although this allowed him to continue to hear cases as needed. He was the first United States Supreme Court Justice to assume Senior Status. Van Devanter passed away on February 8th, 1941 in Washington, D.C.
Van Devanter's masonic affiliation is not known. He his listed in multiple publications as being a member of the fraternity.